Auntie Mame: An Irreverent Escapade is one of my favorite books. I stumbled on the reprint edition when it came out in 2001 at my local Barnes & Noble, and the cover caught my eye (yes, I did judge this book by its cover, and I'm so glad that I did, since it caused a love affair with Mame that has lasted for twelve years now). Every couple of years, I need a Mame fix and I pull the book off the shelves and reacquaint myself with all the characters and madcap adventures found within (as well as the sequel, Around the World with Auntie Mame. This current read was done with my book group (I'll be honest: this was my first selection for the book group, which had already been established when they invited me to join, and I was a little concerned how the book would be received. I'm happy to report that it was a rousing success with everyone! ), so it was interesting to have three fresh perspectives on the book, as sometimes after so many readings, some of the finer nuances get lost in the sheer delight of rereading a favorite book (at least it does for me). Mame herself, quite naturally, was the name reason for everyone enjoying the book. Starting off in the Roaring 20s, we watch as Mame's fortunes wax and wane with the Stock Market crash of the late 1920s, and how she struggles to keep her little make-shift family together, which she does through her own indomitable will. Told through the eyes of her nephew, Patrick, we watch as Mame raises him to the best of her ability, and while her techniques for raising a child may not be orthodox, they are certainly effective. Eventually, Mame meets the perfect man for her, and her fortunes are restored and she's back to her madcap ways. Through everything, though, Mame remains strong and resolute in her beliefs of equality and what's best for the people around her. What starts off as a seemingly ridiculous little adventure with a ragtag cast of characters becomes a heartfelt testament to what family means, both with the family we are born with and the family that we make for ourselves, and how important it is to stay true to yourself, even in the face of adversity. For me, this will be a book that I will go back to over and over again for the rest of my life. 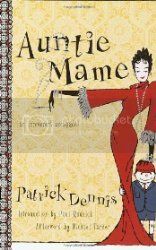 I adore it; I adore the character of Mame; and I adore the message that Patrick Dennis leaves us with this book. If you've never read it before, please give it a chance. I think you'll be pleasantly surprised!